It’s a quiet night in Crown Heights. This is a good thing, says Mendy Hershkop, coordinator for the Shomrim, a community defense group based in the neighborhood. He is on patrol with his cousin, Gadi Hershkop, driving slowly in Gadi’s Town & Country minivan. They have 28 years of experience guarding the neighborhood between them, and, Mendy says every block has a story. He points out where, during the blizzard this winter, they led the police to a barefoot burglar fleeing the scene of a crime. Last week, at Union Street and Kingston Avenue, a group of teenagers stole a scooter from a 12-year-old. Within minutes, one member of the Shomrim was with the boy and his father, and several other members were looking for the teenagers. They found them and reported their location to the police, who made an arrest. 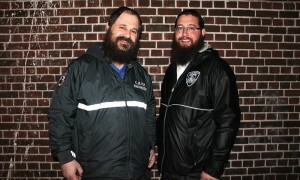 The Shomrim, Hebrew for “guards” or “watchers,” are neighborhood watch groups active in Jewish communities in South Brooklyn, Flatbush, Williamsburg, Los Angeles, Baltimore and the United Kingdom. They are volunteers who help residents with any urgent problems, like if someone is locked out of their car on a cold night or needs to jump-start their battery, and help the police deal with crime. Because they are on call 24/7, and know all the residents, they can address problems in ways the police can’t, Gadi says. The Crown Heights Shomrim were established in the 1960s to provide extra security for the Hasidic Jewish population. The crime rate was higher then. The murder rate in the 71st Precinct, which is comprised of Crown Heights between Eastern Parkway and Clarkson Avenue, has dropped 86 percent since 1990, according to the NYPD. Jewish residents were also targeted during violent riots in 1991, that began after Gavin Cato, a 7-year-old black child, was struck and killed by a car in Lubavitcher Grand Rebbe Menachem Schneerson’s motorcade. Allan Nadler, the director of the Jewish studies program at Drew University, moved to New York shortly before the 1991 riots. He says Jews in Crown Heights felt that police were not there for them. There are currently about 50 members in the Crown Heights Shomrim. “When you call 911, it can take [the police] four, five, six minutes to arrive. When you call the Shomrim hotline, and there happens to be a Shomrim member living on that block, or working in a store a block away, he gets that same description on his radio. He has an eyeball on this bad guy, or criminal, so now when the police arrive, we’re able to tell them, the guy you’re looking for is two blocks away,” Mendy says. 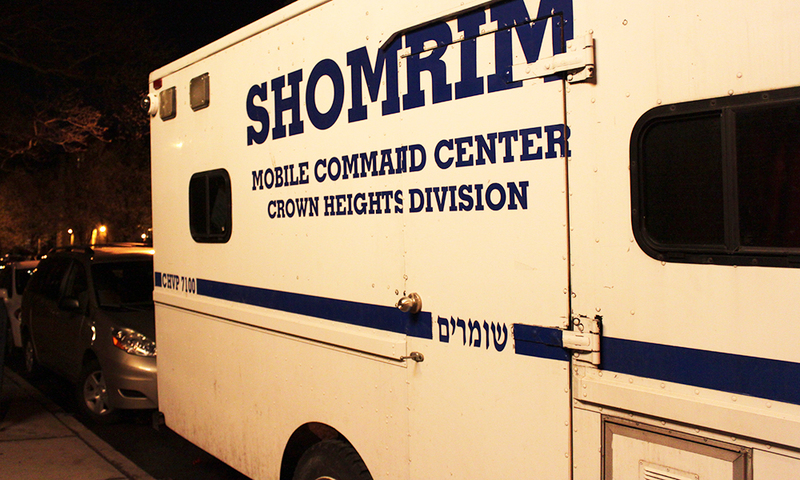 The Crown Heights Shomrim require members to live in the neighborhood. Mendy, and Gadi, 40, both live in Crown Heights. They wear kippas and thick beards, like most Jews from the Chabad Hasidic movement, who make up the majority of Crown Heights Jews. New Shomrim members must work at least part-time and provide character references. Vincent Martinos of the NYPD’s 71st Precinct often works with the Shomrim in Crown Heights. The Shomrim will notify the police about a serious crime, and the police will notify them about community-related problems. They help the NYPD navigate cultural differences in the Hasidic community that officers may be unfamiliar with, says Martinos, who has worked out of the precinct for 23 years. “During certain holidays, what you can and can’t do, carry ID or not carry ID, certain burial rituals, if God forbid there’s a victim of a crime,” Martinos says. The Shomrim cannot make arrests, and tell residents to immediately call 911 about any crimes. Some people may call the Shomrim first, says Rabbi Menachem Vail, who is a principal at Yeshiva Dvarchai Menachem on Rutland Road in Crown Heights. It all depends on the person and the situation, he says, but people probably call the police first for more serious crimes. When they get a call, the Shomrim try to find the perpetrators and keep an eye on them from a distance so that the police can make a fast and safe arrest, Gadi says. They mostly deal with muggings, burglaries, and thefts of purses, cell phones and bikes. There are occasionally assaults and anti-Semitic incidents. The Shomrim hope their visible presence in the area will deter criminals. They also notify residents about threats and other concerns through public service announcements and social media. Catching younger offenders for minor crimes can help them too, Mendy says. “It may deter them from becoming more brazen and doing something they’ll regret for life,” he says. Members of the group help residents with translation and dealing with the police department. They can find a translator for five or six languages within a few minutes, Mendy says, and most members speak Yiddish or Hebrew. They make sure victims of crimes call the police, and help them talk to officers and file complaints. They often assist the police in finding missing people. The NYPD will call Shomrim groups right away about a missing person in the Jewish community, he says, and they usually locate the person within 20 minutes. “They know where everybody is, so if we have a missing child or something they know where to look, they know the schools, the teachers, they know the neighbors,” Martinos says. Rabbi Vail says the Shomrim have helped his school several times, providing extra security for students at departure and arrival times. He had a student once who was leaving school during the day, and asked Shomrim members to speak to the student about the problem. “That was a year ago and he still references that,” Rabbi Vail says. A group similar to the Shomrim, the Brooklyn Asian Safety Patrol, was established last summer in Sunset Park, with assistance from the Boro Park Shomrim. It takes organization and willpower, Gadi says. “Not everybody’s capable of doing it or wants to do it, but it definitely can be done in every neighborhood,” Gadi says. After their patrol a woman stops Mendy and Gadi and asks them about an arrest she saw earlier that day. They tell her not to worry and wish her a good night. She is one of their aunts, they say, and has a direct line to their phones in case anything happens.